Reasons to Sell Assets Through a Liquidation Auction | Wilson Auction & Realty Co, Ltd.
Did you just decide to close down your business for good, or has your business accumulated a large number of items over the years that you no longer need? Well, you could try and sell each and every item on your own. However, outside of taking up a lot of your time, this will also limit the amount of money you can potentially make from liquidating your assets. Therefore, instead of going that route, you should consider working with an auction company to hold a liquidation auction instead. Here are just a few of the benefits of doing it. You will not have to go through the trouble of selling items on your own. As we just mentioned, you are free to try and sell items on your own without the help of an auction company. Nevertheless, why would you want to? From listening items in the local newspaper to trying to find buyers online, you will have a lot of trouble selling each asset that you have one by one. It’s much easier to hold one auction and sell everything at once with the help of an experienced auctioneer. You will attract a larger audience of potential buyers. Most auction companies have loyal followers who will come to just about every auction they hold. A reliable auction company will also go above and beyond to market your liquidation auction so that people show up to it. This will greatly benefit you, because the more people who come to your auction, the more competition that there will be for your items. It will help drive the prices up and bring in more money. You will pretty much guarantee that all of your assets get sold. When you hold a liquidation auction, you won’t have to worry about many items not selling. Your auction company will be able to work with you to set the appropriate prices to attract bids. At the end of the day, that will benefit you greatly by leading to more sales than you might have expected. 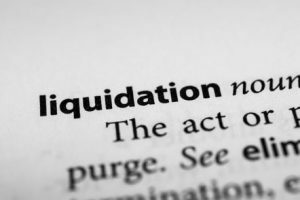 Does a liquidation auction sound like a good idea to you? Then Wilson Auction & Realty would love to speak with you about what a liquidation auction entails and how you can use it to sell your assets. Call us at 419-636-5500 today to get started.